The long weekends are upon us! If you’re planning a short getaway this Christmas or New Year’s, why not consider Bangkok? The city is only a short flight from home, and is known for being a food haven and shopping paradise. In this three-day itinerary, we suss out the best spots to see, eat and shop in the Land of Smiles! With over two centuries of history, the Grand Palace is the home of the Thai royal family. Although entering the buildings is not permitted, you can still tour the open temples and marvel at the stunning architecture representing Thai heritage and culture. Only a ten minute walk from the Grand Palace is Wat Pho. Here, you can view the Golden Reclining Buddha, a must-see when when in Bangkok. You may spend longer than expected navigating the temple grounds as they are rather maze-like. Opposite Wat Pho is the magnificent Wat Arun, also known as the Temple of Dawn. Colourful shards of glass and Chinese porcelain form the intricate design of the temple. Visit during sunset for one of the most breathtaking views of the temple overlooking the Chao Phraya River. PS: As a sign of respect when visiting these temples, remember to be dressed appropriately, in clothes that cover the legs. This unassuming eatery is a ten minute walk from Wat Pho and serves up cured meats paired with locally-produced alcohol. The street food-inspired menu features fragrant soups, salads and curries inspired by cuisine from every corner of the country. Err is the perfect place to stop and refuel in between touring temples in Phra Nakhon. Having recently been bestowed the Bib Gourmand, this is one place where making a reservation is a must! This hidden Bangkok gem is just a short walk from the Grand Palace. Freshly baked cookies infused with chocolate, cream cheese, or matcha filling, topped off with funky ice cream flavours like Berry Cheesecake and Nutella Kid-Cad is all the rave at Creamery. Watch as molten filling oozes out onto the pan like lava right before your eyes when the ice cream is placed on the warm cookie, just before you dig in. Since these cookies are baked on the spot, allow for some preparation time. We promise you they’re worth the wait! Warm up before conquering the famous Chatuchak Market at Asiatuque! Here, you’ll find small boutiques in warehouse-style buildings selling unique handicrafts and edgy fashion pieces. If you’re hoping to snag a couple of handmade fashion pieces by Thai designers, you’re in luck! Besides shopping, be entertained by a Thai puppet performance, or the highly popular Calypso Cabaret ladyboy show before calling it a day. Craving a sumptuous dinner after a long day of sightseeing? Only a short walk from Asiatique is Silver Waves, a gorgeous riverside restaurant serving authentic Chinese fare. Located on the 36th floor of the Chatrium Bangkok, soak in the view of the lights along the Chao Praya river as you dine. With an all-you-can-eat dim sum buffet and an extensive a-la-carte menu featuring meat, poultry and even bird’s nest, Silver Waves is a gorgeous way to conclude your first day in Bangkok. Even if you’ve never been to Bangkok, there’s a good chance you’ve heard of Chatuchak Market, the largest and most happening weekend market in Thailand. Get up bright and early to experience shopping paradise, as this place literally has everything under the sun – from houseware and antiques to clothing and local snacks. A word of caution, however: when it comes to antiques, we advise examining the condition and legitimacy of the item you are buying. Now’s the time to put your bargaining skills to the test as well so you can snag the best deals in town. It can get pretty humid, so be sure to dress comfy and don’t forget to pack on the sunscreen! Famished after your shopping spree? Head over to Laemgate Infinite for lunch! A 30-year veteran of the Thai seafood buffet scene, Laemgate boasts fresh fare at affordable prices. From fresh farm oysters to delicious cooked Thai dishes like Som Tum with pickled crab, Laemgate is your go-to place to refuel after the packed weekend market. Located just a short walk away from Chatuchak, this place is a favourite with locals and tourists alike, and for good reason. Their all-you-can-eat deal will fill you up without breaking the bank. 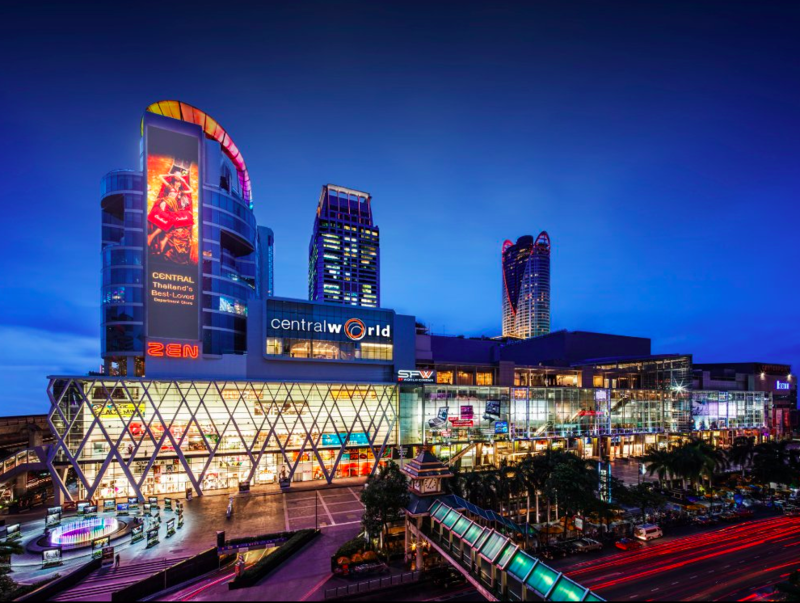 Shopping malls in Bangkok are serious business, and CentralWorld is the largest one. Luxury and commercial brands, high-tech gadgets, bookstores, designer furniture, and even an ice skating rink are all housed under one roof. You will probably end up spending many hours trying to cover ground in this diverse mall, so shop till you drop! If you tire of CentralWorld, fret not, for you can hop to any of the numerous malls nearby. Be ready to channel your inner carnivore at Fireplace. Dating back to the 1960s, this legendary grill serves up some of the best steak in town. Grain-fed Angus is the star of the show, but lamb, pork and seafood options are also available for diners who don’t fancy beef. Located within the cosy Intercontinental, a five minute walk from CentralWorld, this is the place to go to put your feet up once you’re done for the day. Pair your meat of choice with a bottle from their extensive wine list and treat yo’ self! From sharks to seahorses, this aquarium has it all! Located within Siam Paragon, and home to over 400 different fish and marine animals, no trip to Bangkok would be complete without a tour of this insta-worthy location. Try to spot clownfish and lionfish in the coral reef tanks and take a walk through the ocean tunnel. Feeling brave? Attempt the shark walk, where you can watch leopard and tiger sharks swim right beneath your feet. In the mood for seafood? Nippon Kai is the place to go! One of the most iconic names in the world of Japanese cuisine, this place serves up fresh seafood, steak and donburi at affordable prices. If you’ve always wanted to try fugu, this is the place for you. Fresh fugu, sayuri and okoze are available seasonally and are snapped up as soon as they become available, so be quick! Be sure to check out the selection of Japanese snacks and produce below the restaurant after your meal as well. No visit to Bangkok is complete without a stop at Dream World! Toting itself as the ‘World of Happiness’, this amazing theme park is big enough to spend the whole day in. Let your inner child run wild here, with imported thrill rides and four different zones. Be sure to catch the ‘Colour of the World’ parade in the Dream Garden every weekend, and take some photos at the Plaza, which includes a copy of Disneyland’s Main Street. Got a sweet tooth? This is one place you must visit! Not only is After You insta-worthy, their artisan desserts are to die for. Get their famed Shibuya Honey Toast, or their shaved ice – perfect on a hot day in the city. Click here for more information on After You Dessert Cafe. Get even more last-minute shopping done on your last day in Bangkok at Terminal 21 shopping mall. This cosmopolitan mall is worth the visit as you’ll find specialty products from all over the globe. Whether you’re looking for branded products or items from independent designers, Terminal 21’s got it all! Conclude your Bangkok adventure by dining at basil, a contemporary restaurant serving authentic Thai fare with unique Thai-inspired cocktails. Located in the swanky five-star Sheraton Grande, basil is the perfect place to unwind. Try their deep fried seabass paired with a speciality cocktail from their extensive drink and wine menu. Sworn off drinking? basil has plenty of non-alcoholic concoctions on offer, so you won’t miss out on the fun!